Can Wind Turbines Help Keep Rural America Intact? Wind Turbines offer rural communities a model for development, besides what has normally been the only offering in recent decades, (at least in my state) – new prisons. Keeping rural communities vital is a valuable hedge against sprawl, preserves valuable farmland, and keeps families and communities intact. Our small town folk need all the help they can get. Research is showing that support for wind turbines rises in communities that actually have them. • Do revenues rural landowners receive from wind energy projects change their on-farm investments or long-term succession plans? • How does proximity to a wind farm impact residential demand for farmland? • How do zoning ordinances affect availability of developable land in the area surrounding a wind farm? Mills said she also spoke with township supervisors, assessors, realtors and auctioneers. In doing so, she heard a “really interesting” prospect. The study showed participating landowners are more likely to build a new home, but that those not on farmland are still building. In fact, this support is highest in places that already have experience with utility-scale turbines, despite some concerns about potential local government and citizen opposition due to the nearly 500-foot tall machines. 53 percent supported new local wind turbines while just 16 percent oppose them. Support rises to 75 percent among local leaders in jurisdictions that already have utility-scale turbines. The primary factors encouraging adoption of wind power are economic issues, including revenue for land-owners, local property tax revenue, and job creation. The most common factors that discourage adoption of wind power are concerns about visual and noise impacts, as well potential negative outcomes on property values. “We were surprised by the particularly high levels of support in jurisdictions where large turbines are already spinning. 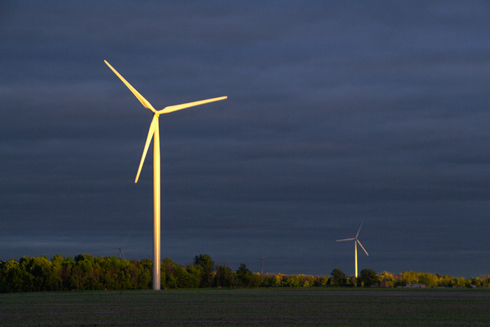 These findings might allay some of the concerns about further expanding the use of wind power in Michigan,” said Sarah Mills, a doctoral student and policy analyst at the U-M Ford School’s Center for Local, State, and Urban Policy (CLOSUP), which conducted the survey as part of the Michigan Public Policy Survey program. Since the ‘80s, government’s only real tools for protecting farmland have been providing preferential taxes to farmers or purchasing the development rights to farmers’ land, Mills says. But she wants to study other approaches. For example, she’s fascinated by the possibilities of a concentration of recently erected wind turbines in central Michigan; the 133 turbines spread over about 200 farms in Gratiot County make up the largest wind farm in the state. In addition to generating electricity, the turbines could play an important role in preservation: first, they bring farmers rent, an important subsidy to their farming operations; second, safety rules bar building near the towering structures, effectively stopping development cold. Where wind energy is a topic of discussion, 53% of officials support adding turbines in their own jurisdictions, while 16% oppose this. However, in jurisdictions where turbines are currently sited, local officials’ support for additional local wind development significantly increases, to as much as 75% in jurisdictions with utility-scale turbines currently. Not really relevant to the post, but I have an observation. I love the look of turbines. We have several quite sizable wind farms in South Australia and, a few years ago, I had to drive past one of them fairly regularly. My husband, otoh, finds them ugly but can’t analyse or describe the problem. One thing we haven’t sorted out is why we both regard those gigantic _things_ holding up high voltage lines as extremely ugly, but that doesn’t transfer across to the turbines for me although it seems to for him. . I find them ominous and a bit threatening. I presume that’s some kind of gut reaction to the vaguely human-but-giant form and the impression of them marching across the landscape that makes them seem invasive. I suppose turbines look sort of as though they’re keeping themselves to themselves while they do what they do rather than going anywhere. Whatever it is, I can’t help liking them visually as well as for their function. “I find them ominous and a bit threatening”, says adelady. Me too. I have never gotten very close to a big wind farm. The many I saw in Texas were far enough back from the road that the size of the turbines was not as apparent., although “marching across the landscape” like an alien army is an apt description. There are no wind farms to speak of in the East where I live. The only one I’ve seen here at closer range is in the marshes on the edge of Atlantic City, NJ, and it’s only 5 turbines. IMO, it’s because they’re so BIG and they MOVE, and do that so powerfully. There’s enough energy in those blade tips to bat a Volkswagen for quite some distance, and I can’t help but imagine that when I see them even though they are visually attractive because they do move and they’re big and can seem human-like. I too find the transmission line towers ugly, but they don’t move and they’re not anywhere near as big, to say nothing of the fact that they are not as “new” and we’ve gotten used to them over the years. It might be an interesting experiment to fly in a planeload of some aboriginal group that has never seen either technology and ask them what they think about the “looks”. Not me. Maybe they reminded me of a monster movie/ comic/ story or something from when I was young. But I’ve always hated the ugly things looming over the landscape. They give me the shivers. That “looming over the landscape” is likely much more apparent in more wide-open South Australia than in the U.S. I grew up in the area where Edison worked and all the early commercial electricity ventures took place, and it was covered with poles, towers, and wires many decades before I was born.